One of the joys of doing a lot of high tech and scientific naming is that we get to see so many leading edge products and solutions. Of course, we can’t talk about them for months (even years) sometimes. So it really is heart warming when we see the success our customers have – especially when they get a full article to themselves in Business Week. 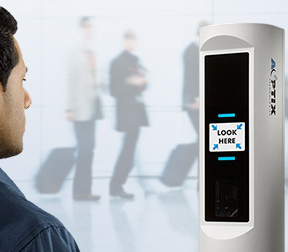 That is where you can read Through Airport Security in the Blink of an Eye, the story of Aoptix’s InSight® Iris recognition system. Never mind what your passport says or your ID card purports to identify you, the Iris of your eye is always unique and now you can be scanned quickly and accurately. Interestingly, they are discovering that the speed of processing passengers is almost as big a win as the security factor. I suspect it is even deployed, or being deployed, in a lot more places than they care to mention here. Regardless, we are proud to have been part of their naming efforts and applaud their cross over of outer space technology to biometrics usages.